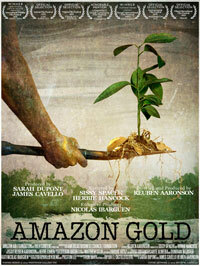 Narrated by Academy Award winners Sissy Spacek and Herbie Hancock, Amazon Gold is the disturbing account of a clandestine journey into the Amazon rainforest. Ron Haviv and Donovan Webster, two war journalists led by a Peruvian biologist, uncover the savage unraveling of pristine rainforest. They bear witness to the apocalyptic destruction in the pursuit of illegally mined gold with consequences on a global scale. An animated Agouti springs to life to tell the story of his ecosystem. Left in the wake of surreal images of once extraordinary beauty turned into hellish wasteland, Amazon Gold reaffirms the right of the rainforest to exist as a repository of priceless biodiversity.